From September to November 2018 Madeleine Regan spent time in the Veneto region to research for her PhD studies. She received a scholarship from the Cassamarca Foundation and a donation from the Veneto Club Inc. Adelaide. The focus of Madeleine’s research is the role of the second generation in documenting the history of family emigration. 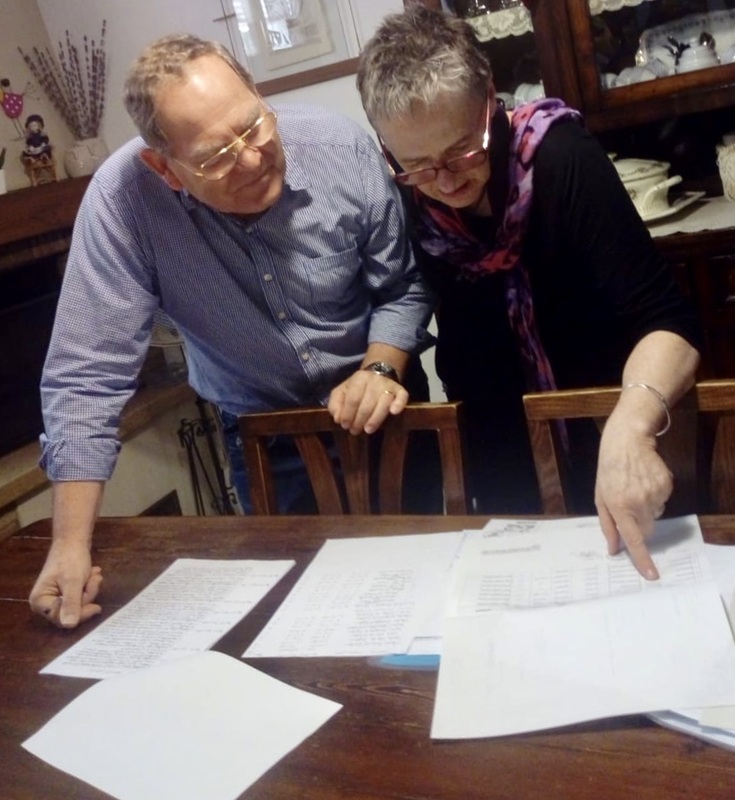 She has gathered oral history interviews with family members to find out why their parents emigrated from the Veneto region between 1926 and 1928. Madeleine stayed at Castelfranco Veneto and undertook research in parish archives and in several comuni. 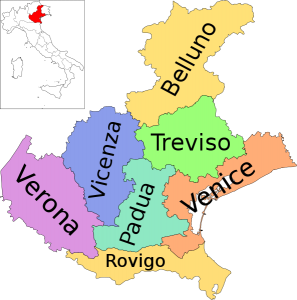 She researched in Malo in the province of Vicenza and Castelcucco, Caselle di Altivole and Altivole, Riese Pio X, Valla’, Bigolino and Valdobbiadene in the province of Treviso. She also gathered information from Ponzano Veneto. Madeleine recorded 12 oral history interviews mostly with people of the second generation born in Australia and who now live in Italy. There are now 58 interviews in the collection. Madeleine was also grateful for the support of Angelo Piovesan in Adelaide and Paola and Stefan Palù in Ponzano Veneto. 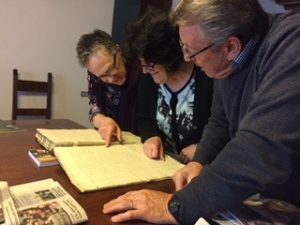 You can read Madeleine’s blog to find out more about her research and contact with the community in Adelaide and in the Veneto region. Please look at the changes we are making to the website over the next few months. 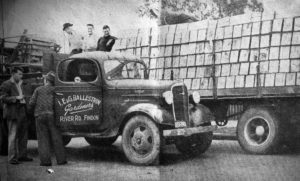 l Ballestrin – Isidoro, Ermenegildo & Giuseppe market truck c1950s. In 1927 three members of the large extended Ballestrin family arrived in Adelaide on 20 September 1927 per ‘Regina d’Italia’. Brothers Antonio, (born 21 September 1902) aged 25 years, and Isidoro, (born 15 May 1905) aged 23 years, and first cousin, Giuseppe, (born 19 July 1910) aged 17 years emigrated from Valla’ in the province of Treviso. In the first years during the Depression it was difficult to find employment but the Ballestrins managed to work and saved enough money to return to Italy in 1934. Each of them got married there and returned to Adelaide with their wives in 1935. Initially they worked market gardens in Virginia, about 34 kms north of Adelaide. In the early 1940s the families moved to the Kidman Park – Flinders Park area and they developed market gardens. Isidoro and his wife, Gina nee Andreazza (born 5 December 1905), leased land from Edward Keele on the western side of River Road (now Findon Road). At the beginning of the 1940s they took up a lease of 15 acres on the eastern side of Findon Road, and worked 17 glasshouses growing tomatoes and other vegetables on land which they eventually bought. Their son Frankie continued to work on the land growing potatoes at Bolivar for a number of years. Isidoro died on 5 May 1965. Gina died 18 April 1978. Antonio married Romilda Minato and they worked market gardens on Grange Road close to Eugenio and Luigia Zalunardo. Romilda died on 4 January 1957. Antonio returned to live in Italy and died on 3 April 1977. A third brother, Ermenegildo Ballestrin, born 7 February 1911, joined Antonio and Isidoro, arrived in Adelaide per ‘Esquilino’ in 1937 aged 26 years. At first he stayed with Isidoro and Gina and worked in the market gardens. Giuseppe and his cousin, Ermenegildo bought 20 acres in Flinders Park abutting the River Torrens. Giuseppe married Cesira Tieppo and Ermenegildo married Norina. The families worked glasshouses where they grew tomatoes and also grew potatoes and celery. Giuseppe died on 15 June 1989. Cesira died on 6 December 2005. Ermenegildo died on 28 February 1988, and Norina on 5 August 2005. Narcisio, born 30 July 1913, brother of Antonio, Isidoro and Ermengildo, was aged 25 years when he arrived per the ‘Romolo’ on 10 December 1938. His wife, Maria Maddalena nee Dotto (born 10 June 1914) arrived with their son, Egidio (Jimmy) aged one year old on 5 June 1940. The family leased land first on Valetta Road and around 1953 bought a holding at Flinders Park, east of Findon Road. After finishing in the market gardens they moved to Findon. Maria died on 17 February 1988. Narcisio died on 20 February 2007. In April 1938, two other family members arrived on the ‘Romolo’: the mother of the four Ballestrin brothers, Santa Ballestrin nee Guidolin, (born 1874) aged 65 years, and their sister, Luigia, (born 1 December 1916) aged 23 years. They lived with Isidoro and Gina. Luigia married Eugenio Zalunardo in 1944 and they lived and worked market gardens on Grange Road. They had two children, Noemi and Renato. Luigia died on 22 December 1965. Eugenio died 13 November 1972. Santa died on 5 July 1945. Two Ballestrin brothers: Ermengildo and Narcisio, and cousin, Giuseppe, worked in the Allied Works Council during the War. They were required to live away from Adelaide including in the Northern Territory. Isidoro who had a health problem, grew vegetables for the Australian Army. The Ballestrin families began selling their land in Flinders Park from the late 1960s when the area was subdivided by developers. This website will continue to be added to over time. More stories and interviews will be added as they are completed. For more information click this link to contact Madeleine Regan. Da settembre a novembre 2018 Madeleine Regan è andata nella regione Veneta per ricercare informazioni per il suo dottorato di studi. Ha ricevuto una borsa di studio dalla Fondazione Cassamarca e una donazione dal Veneto Club Inc. Adelaide. Il punto della ricerca di Madeleine è stato quello di documentare la storia delle famiglie della seconda generazione che emigrarono in Australia. Ha registrato le storie orali con i membri famigliari per sapere le ragioni che spinserò i loro genitori di emigrate dal 1926 al 1928. È rimasta a Castelfranco Veneto e ha ricercato negli archivi parrochiali in parecchi comuni. Ha fatto delle ricerche a Malo nella provincia di Vicenza. Ha fatto oltre ricerche a Castelcucco, Caselle di Altivole, Altivole, Riese Pio X, Valla’, Bigolino e Valdobbiadene nella provincia di Treviso. Ha raccolto anche informazioni da Ponzano Veneto. Madeleine ha registrato 12 interviste orali con la seconda generazione nata in Australia che adesso abita in Italia. Ci sono adesso 58 interviste nella collezione. Maria Monica Urbani a Malo in provincia di Vicenza. Madeleine ringrazia anche per il supporto di Angelo Piovesan ad Adelaide e Paola e Stefan Palù a Ponzano Veneto. Potete leggere il blog di Madeleine per sapere di più della sua ricerca e contattare con la communità ad Adelaide e della regione Veneta. Per favore nota che ci saranno cambiamenti nel website nei prossimi mesi. Nel 1927 tre della famiglia Ballestrin arrivarono ad Adelaide. Fratelli, Antonio, 25 anni e Isidoro, 23 anni e un cugino di primo grado, Giuseppe di 17 anni arrivarono il 20 settember 1927 con la nave, ’Regina d’Italia’. Nei primi anni durante la depressione era molto difficile trovare lavoro. I Ballestrini però trovarono lavoro e avevano risparmiato abbastanza per ritornare in Italia nel 1934. Ognuno di loro si sposò e le tre coppie ritornarono ad Adelaide nel 1935. Antonio sposò Romilda Minato; Isidoro sposò Maria Gina Andreazzae Giuseppe sposò Cesira Tieppo. Lavorano come articoltori prima a Virginia 34 chilometri a nord di Adelaide. Negli anni quarate le famiglie si trasferirono nell’area di Flinders Park e Kidman Park. Il padre di Frankie Ballestrin, che si chiamava Isidoro, e la moglie, Gina, affittaraono terreno da Edward Keele nella parte ovest di River Road addesso chiamata Findon Road. Al principio degli anni quaranta preserò in affitto 15 acri nella parte est di River Road addesso chiamata Findon Road. Lavorarono 17 serre producendo pomdori e altre verdure. Eventualmente comprarono la proprietà. Ermegildo Ballestrin, un terzo fratello di Antonio e Isidoro, arrivò 1937 all’età di 26 anni e lavorò con i fratelli come agricoltore. Giuseppe e Cesira e Ermengildo comprarono 20 acri in Flinders Park a fianco del fiume Torrens. Lavorarono nelle serre producendo verdure, patate e sedano. Giuseppe è morto nel 1989 e Cesira nel 2005. Ermenegildo sposò Leonora (Norina). Lui è morto nel 1988 e Norina nel 2005. Narcisio, fratello di Antonio, Isidoro e Ermengildo, arrivò il 10 dicembre 1938 a bordo del ’Romolo’ all’età di 25 anni. La moglie, Maria Maddalena nata Dotto e figlio, Egidio chiamato Jimmy che aveva un’anno, arriavarono il 5 giugno 1940. La famiglia affittò il terreno prima in Valetta Road. Circa 1953 comprò il podere a Flinders Park est di Findon Road e vicino a Isidoro e Maria Gina. In aprile 1939 altre due familiari arrivarono a bordo della nave ’Romolo’. La madre dei quattro fratelli Ballestrin, Santa Agata Ballestrin nata Guidolin, 65 anni di età e sua figlia, Luigia, 23 anni vennero con Isidoro e la sua famiglia. Luigia sposò Eugenio Zalunardo nel 1944 e visserò e lavorarano come agricoltori in Grange Raod. Santa mori nel 1945. Durante la seconda guerra mondiale, i due fratelli Ballestrin: Ermengildo e Antonio, e il cugino, Giuseppe lavorarono per il governo nel Allied Works Council. Tanti Italiani erano costretti a vivere lontano di Adelaide. Alcuni di loro andarono a vivere nella campania e il territorio del nord. Isidoro chi aveva la salute poco buona restò in Adelaide e continuò a produrre verdure per l’esercito Australiano. Due famiglie Ballestrin vendetterò la proprietà in Flinders Park negli anni sessanta e l’area è stata suddivisa per costrutire case. Isidoro mori’ nel 1965 e Frankie continuò lavorare il terreno a Flinders Park fino a agli anni settanta. Antonio mori’ in Italia nel 1977; Isidoro nel 1965; Ermegildo, 1988; Narcisio, 2007. Le mogli sono morte: Maria nee Dotto nel 1988, Maria Gina nel 1978 e Maria nel 1988.